Using data from Chandra, NASA’s Spitzer Space Telescope, and ground-based facilities, scientists have created new three-dimensional (3D) viewer that will allow users to see the Cassiopeia A supernova remnant like never before. 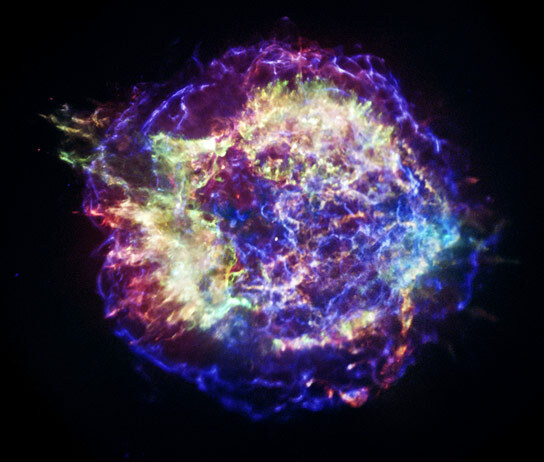 One of the most famous objects in the sky – the Cassiopeia A supernova remnant – will be on display like never before, thanks to NASA’s Chandra X-ray Observatory and a new project from the Smithsonian Institution. A new three-dimensional (3D) viewer, being unveiled this week, will allow users to interact with many one-of-a-kind objects from the Smithsonian as part of a large-scale effort to digitize many of the Institutions objects and artifacts. Scientists have combined data from Chandra, NASA’s Spitzer Space Telescope, and ground-based facilities to construct a unique 3D model of the 300-year old remains of a stellar explosion that blew a massive star apart, sending the stellar debris rushing into space at millions of miles per hour. The collaboration with this new Smithsonian 3D project will allow the astronomical data collected on Cassiopeia A, or Cas A for short, to be featured and highlighted in an open-access program — a major innovation in digital technologies with public, education, and research-based impacts. To coincide with Cas A being featured in this new 3D effort, a specially-processed version of Chandra’s data of this supernova remnant is also being released. This new image shows with better clarity the appearance of Cas A in different energy bands, which will aid astronomers in their efforts to reconstruct details of the supernova process such as the size of the star, its chemical makeup, and the explosion mechanism. The color scheme used in this image is the following: low-energy X-rays are red, medium-energy ones are green, and the highest-energy X-rays detected by Chandra are colored blue. Cas A is the only astronomical object to be featured in the new Smithsonian 3D project. This and other objects in the collection – including the Wright brothers plane, a 1,600-year-old stone Buddha, a gunboat from the Revolutionary War, and fossil whales from Chile — were being showcased in the Smithsonian X 3D event, taking place on November 13th and 14th at the Smithsonian in Washington, DC. In addition to new state-of-the-art 3D viewer, the public will be able to explore these objects through original videos, online tours, and other supporting materials. Cas A is the only supernova remnant to date to be modeled in 3D. In order to create this visualization, unique software that links the fields of astrophysics and medical imaging (known as “astronomical medicine”) was used. Since its initial release in 2009, the 3D model has proven a rich resource for scientists as well as an effective tool for communicating science to the public. Providing this newly formatted data in an open source framework with finely-tuned contextual materials will greatly broaden awareness and participation for general public, teacher, student and researcher audiences. See more at Chandra X-ray Observatory. Be the first to comment on "3D Viewer Offers a New Look at Cassiopeia A"